Like Garrett, myself and my partner have been involved in the barefoot trimming industry right from day one. But not in the U.S. – we are based in Australia. After I learned more about the true needs of the hoof to function properly, keeping horses barefoot just made perfect sense to me. I felt it was not a choice anymore. 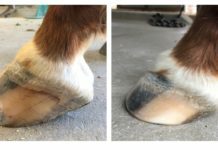 Perhaps because I was an Equine Massage therapist and had in interest in equine biomechanics before I learned barefoot trimming, when I “felt” the amazing muscular changes it made to the entire horse I knew it was changing much more than just their hooves. I wanted to share this information with others as it seemed so cruel to me that so many generations of horses had lived, and died on crippled feet. It seemed so unfair that they had a lesser quality of life simply because they were locked 24/7 onto steel shoes. To help others find this information we created Equethy Barefoot Trimming workshops for horse owners and then later we started Easycare Down Under to give barefoot riders access to great hoof protection for their barefoot horses. Back in those early days I was very lucky to meet two amazing people, Andrew and Nicole Bowe (The Barefoot Blacksmith). 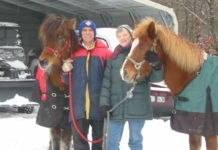 Andrew was a Master Farrier looking for the holy grail of hoof care (a cure for navicular) and Nicole, his wife, a vet nurse who looked after the laminitic horses in their care. They were also frustrated at the lack of formal training for professional barefoot trimmers. So together we created a course to meet this growing need. To do this we drew on the incredible range of talented educators we had met through our interest in barefoot. People like Professor Robert Bowker whose amazing research is the benchmark for our understanding of why barefoot works. Eventually we created a Diploma level course (Equine Podiotherapy) based around specialist rehabilitation strategies for serious hoof issues using barefoot principles. I only mention all the above so that I you can see we have tried very hard to change hoof care here, and to offer background for my perspective below in answer to Garrett’s question. 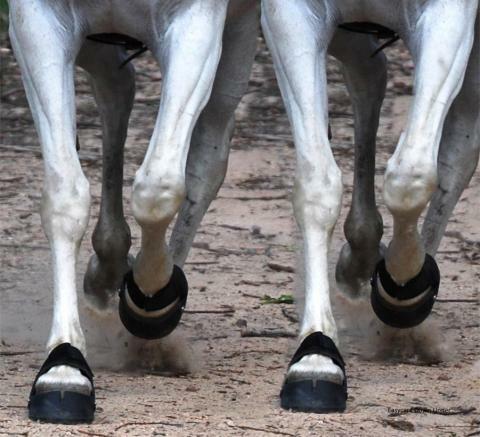 Nearly every day, I speak to horse owners who have turned their horse’s hoof health around. People who have gone outside their comfort zones and tried something new and been rewarded by great successes. But what most of these conversations has in common is that these horse owners feel uncomfortable because they have often gone against traditional hoof care recommendations from their vets to save their horses. Because of this they just don’t tell the vets. 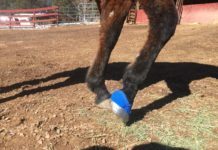 So, in answer to Garrett’s question, I feel that the biggest stumbling block to improving hoof care at this time is the lack of knowledge by our veterinary profession about the number of horses whose lives have already been changed by barefoot. I believe that this is because vets do not see the work of the barefoot trimmer so they do not know about its powerful healing or the huge numbers of horses that already have better hooves & bodies because of it. They see only traditional shoeing with all the usual outcomes that follow from that. I have equine vets as friends, and say that their university training was crammed with a billion lessons about a squillion animals, and that equine hoof care was but a tiny tiny part of their training. Basically they were taught to just head for the traditional shoeing options. To use corrective shoeing and drugs, plus they were told that “horses just have bad feet” and most of their work will therefore be “salvage” procedures. I feel that if more vets, especially top equine vets, could actually see what is happening at the coal face they would explore the research further. If they could just see the cases where the trimmers have changed the outcomes where traditional options have been tried and failed, then they would embrace and recommend barefoot/booted as the norm for all horses. So if you have a barefoot horse that has benefited from being barefoot trimmed; be brave, and take a stand for a better quality of life for all horses. Write your vet a lovely email. Send him a photo of your horse’s hooves. Thank him/her for the wonderful care they offer your animals and tell them why you have moved away from traditional hoof care and invite him/her to call in and have a look at your horse. I believe that it will make a difference. Horses are such gentle creatures, if we choose to have them in our lives we are also responsible for the quality of their lives too.